Usually gubadija prepare for guests. 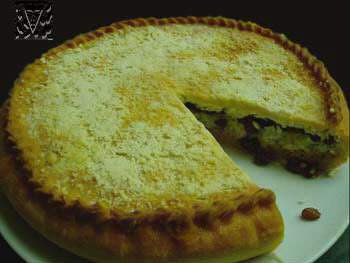 Gubadija is a large, round pie with the multi-layered filling. As filling add a qort (tatar dry curd), boiled rice, fried onion with the chopped meat, finely cut egg, raisin/pl or dried apricots without stones or prunes. Every ingredient prepare separately. Gubadija can be prepared as from unleavened so from yeast dough with plenty of oil. Gubadija can be meat and fruit. In fruit gubadija meat is not added and give to tea. Meat gubadija is good to hot, she is given to clear soups. There is the rolled dough to lay on the preliminary oiled frying pan. Then add from above, at first skim of boiled rice, after more thick layer of qort and again fig. by the Next layer the finely cut boiled eggs (4-5 mm) and again fig. Over rice proparasite raisin/pl or kuraga (dried apricots without bones or prunes). Abundantly pouring filling oil all of it is covered by the layer of test licking into the shape of pie adorning. We put in a stove and prepare approximately about 50. On the frying pan of middle sizes : a 800 g of dough, 350-400 g of qort, 1-1,2 kg of boiled rice, 200-300 g of raisin/pl or other fruit, 8-10 eggs, 350-400 g of oil.